Clondalkin residents are concerned about rats seen near the local bus stop and in the field where children play. IT WAS SEAGULLS last week, but this week South Dublin residents say council officials must take urgent action against the presence of rats in their estate. 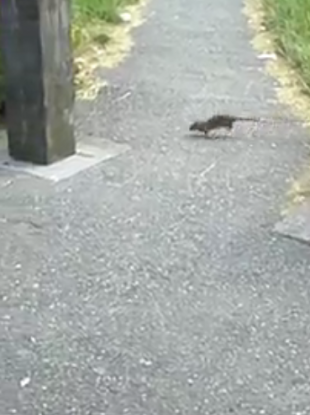 Rat sightings in an estate in Clondalkin has angered local residents who say that not enough is being done by South Dublin County Council to solve the problem. Local councillor Trevor Gilligan said that rats have been spotted at the local bus stop at the Glenfield estate, while residents have also seen rats in the nearby field where children often play. Speaking to TheJournal.ie, Gilligan said the sightings of rats is “a regular occurrence”. “One only has to wait five minutes to see the rodents,” he said, adding that residents are unhappy with the council’s response to the problem. The council have said that illegal dumping in the area is the main contributing factor to the presence of rodents, however, residents dispute this. While illegal dumping could be aggravating the situation, it is the bushes where the rats are residing which is the biggest concern. Local resident Stephen Sheridan said his wife, who is seven months pregnant, is terrified to use the bus stop. “She has to use it every day and every day she sees a rat at it,” said Sheridan, who said that as she is so heavily pregnant she can not walk to the next stop. “The bushes where the rats are residing border the Font Hill Road. They are extremely overgrown. On Saturday, four rats were seen at the edge of the bushes where there were ten kids playing in the field where the bushes are,”he said. “We have warned the children not to go near the rats if they see them, but kids are kids. This is a health and safety issue that needs action now,” said Sheridan. A statement from South Dublin County Council to TheJournal.ie said they are aware of the situation. The claim that “dumping of waste” is occurring in the area near the hedge and is attracting vermin. In the statement the council suggest that local residents should “part take in Community Cleanup effort. Support is available through for local groups through the Social Credits scheme. Local participation and ownership of areas reduces the occurrence of casual dumping”. The council said that the Public Realm Section will continue to litter pick and collect dumped material. “Where material is found that could be used as evidence to prosecute those responsible, this will be forwarded to the Litter Wardens for attention,” they said. “The hedge will be listed for works in the Arboricultural Program of 2014 and 2015,” they concluded. Residents have been informed that hedge cutting takes place in the winter months and that none will be done this summer. Sheridan said the response by the council is “not acceptable”. “If we wait until winter to do anything it will be too late. Their plan to wait until wintertime is just not adequate. As the temperatures drop the rodents will be looking for shelter and they could try and get in somewhere. Our major concern is that they will get into homes,” said Sheridan. Gilligan said “while the Tidy Town Group do great work in the area, it shouldn’t be the job of the residents to pick up litter where rats are living”. “We are looking for removal of these bushes and not trimming. The council are the ones who planted them in the first place, and if they can’t maintain them, we want them gone”. Email “Dubliners: 'Never mind the seagulls, come sort out our rat problem'”. Feedback on “Dubliners: 'Never mind the seagulls, come sort out our rat problem'”.